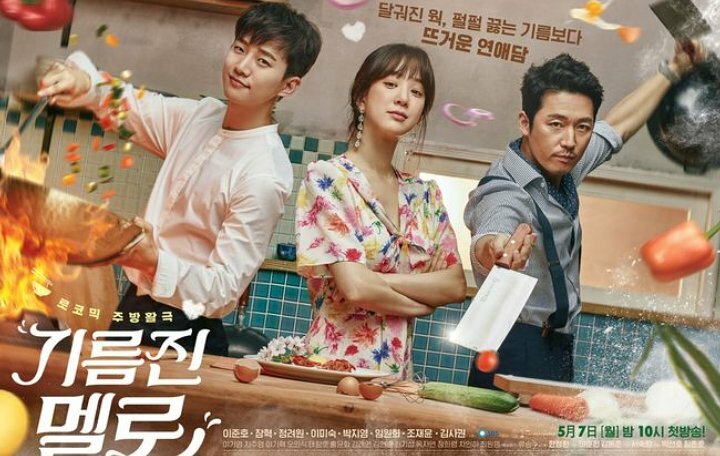 Wok Of Love starring Jang Hyuk, Jung Ryeo Won, and Lee Jun Ho, actually, nothing was wrong with Drama. First episode was hilarious. The writer did a great job at building the atmosphere and developing the characters. The characters were all different and unique. Each of them had their own charm and I think it was great. Doo Chil Seong (Jang Hyuk) and Dan Sae Woo (Jung Ryeo Won) first encounter was so so cute. Dan Sae Woo was just too hard to resist. She was such a cute, lovely, and sweet character. A very talkative person. A type of person who would befriend anyone she just met. It was always delightful when she’s on screen since she’s mostly a positive person. Doo Chil Seong, an ex gangster, opened a Chinese restaurant for his followers so they could start a brand new life but they were all useless. They used hands and mouth instead of their brain. His followers irritated me like every single time. But Doo Chil Seong as a character was so cute. Jang Hyuk was great at portraying the silly side of Doo Chil Seong. One thing, he had crush on Dan Sae Woo. Seo Poong (Lee Jun Ho), a skilled and successful sous chef of a six star hotel. He was the one who contributed to get his restaurant a Michelin star. His wife apparently had an affair with his hotel CEO. Because of this Seo Poong decided to take revenge on the CEO by opening a Chinese food restaurant in front of the hotel. The restaurant in from of the hotel happened to be Doo Chil Seong’s. One thing, he also had crush on Dan Sae Woo. It’s your typical triangle love story. I was at ep 10 when I decided to drop this. Maybe it’s just me but we’re only 300 minutes into the drama which will be 1,200 minutes long (40 episodes times 30 minutes each) and it was already pretty draggy. I get it that dramas tend to become boring midway to the end but to become boring when it’s not even at midway point is a bit…. Besides, Drama did not give me butterflies or make me curious about the next episode. The drama felt dull as the episode went on. For me, as the episode went on more and more filer scenes -those unnecessary, meaningless scenes- were added, dropping the value of the plot and just confused the viewers. Drama, except the casts, was pale compared to other dramas I was watching. Writer’s last project, Jealousy Incarnate, was like this too. It was good and all on the first few episodes and after that it became boring from mid until the end. I enjoyed the drama but I just enjoyed it. It didn’t give me happiness or excitement after I finish an episode. Finishing that drama was more like an obligation rather than excitement. I don’t have any confidence that by the end of the run I’m going to adore this drama. Taking Jealousy Incarnate as reference, I think Wok Of Love is going the same route like Jealousy Incarnate. Not a wrong thing though. There were many people who seriously liked Jealousy Incarnate and are currently loving Wok of Love. But I don’t think I can be like them. I still have 30+ dramas waiting to be watched so I decide to drop Wok Of Love. Besides, Dan Sae Woo was copy-paste of Pyo Na Ri in Jealousy Incarnate. They were like long lost sisters. Both of them had same characteristics. It felt like I was watching Pyo Na Ri. There’s nothing wrong with drama, really. Acting is great, plot is good –even though it’s pale for me. It’s just me not having the confidence that I’ll adore the drama.